Does this man know how to have a good time? Answer: yes...but he also knows how to deliver a good time! The photo above was taken during the official September 2000 unveiling of Paramount Home Video's latest Peanuts release, "It's the Pied Piper, Charlie Brown." 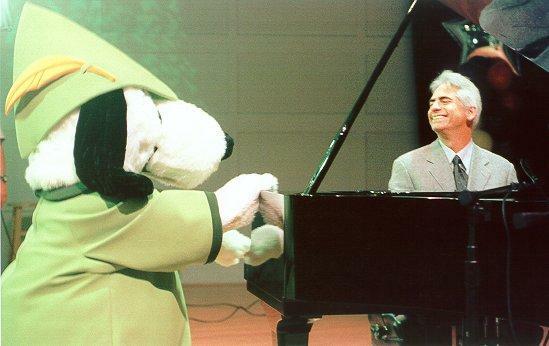 In continuing support of his popular Spring 2000 release, "Here's To You, Charlie Brown: 50 Great Years," contemporary jazz piano great David Benoit has developed a wonderful, heartfelt tribute to the genius of late Peanuts creator Charles Schulz...and is taking the show on the road. Benoit, describing the show, noted "This concert is a personal tribute to Charles Schulz that will incorporate the different kinds of music that defined the Peanuts sound. That includes straight-ahead jazz, R&B and classical. It's a broad and exciting musical journey. I have been playing tunes form the new album all summer during my regular concerts to a very warm reception, and this new show is geared exclusively around the audiences' love for the strip. It's a chance for them to reminisce about it through the music, to experience Charlie Brown all over again. I'm hoping longtime fans of my own music will be joined by new faces who have felt a longtime connection to the magic of Peanuts." 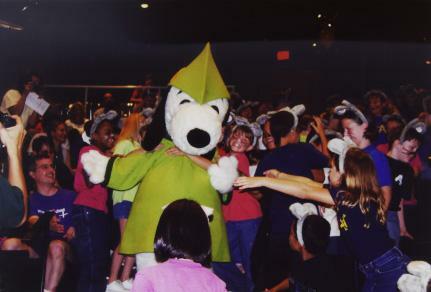 Above left, Pied Piper Snoopy poses with an audience of "mouse children" at the world premiere of "It's the Pied Piper, Charlie Brown," the final animated special created under Charles Schulz's supervision. 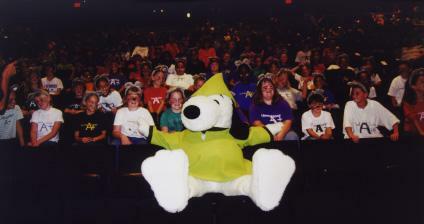 At right, children from St. Paul's Linwood Elementary Achievement Plus School greet Pied Piper Snoopy. Both photos are by Mark Brouwer, © 2000, and appear courtesy of EmeraldLight Productions. As reported on September 8, 2000, by Karl J. Karlson in the St. Paul Pioneer Press, the premiere was held for a select audience, most of them youngsters from the neighborhood where the "Peanuts" creator grew up. The half-hour video is the most recent of nearly 60 animated features based on the "Peanuts" characters Schulz drew for nearly 50 years. The premiere at the Minnesota History Center auditorium was attended by students from the Linwood Elementary Achievement Plus School in St. Paul. They dressed up like mice, with mouse "ears" and painted faces, to reflect some of the show's content. The show is based on "The Pied Piper of Hamelin," the German folk tale of a musician hired to drive out the city's rodents. In this case, it is Snoopy who saves a town overrun by soccer-playing, tap-dancing, sports mice. Photo © 2000 Paramount Pictures. The students took part in a pre-show parade, which was taped and used to promote the show, according to Kathy Burns, Twin Cities producer of the event. After the event, Benoit signed autographs for the children. 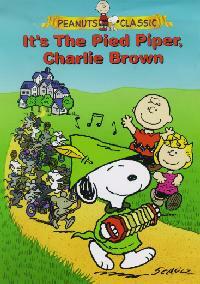 "It's the Pied Piper, Charlie Brown" is produced by Lee Mendelson and Bill Melendez, who have produced all of the animated short shows for Schulz. Most of the shows were aired as television specials, though some were released directly to the videocassette market. But just who is David Benoit, and what's his connection with Peanuts? Let's start with this recent Peanuts music release, Here's to You, Charlie Brown: 50 Great Years, on the GRP label (314 543 637-2). This lovely album features 10 cuts, of which seven are by Guaraldi. (One of the others is Clark Gesner's "Happiness," from You're a Good Man, Charlie Brown; the other two are Benoit originals, most definitely in the Guaraldi Peanuts mold.) Perhaps most intriguing is that the lead-off rendition of "Linus and Lucy," thanks to the magic of mixing, teams the David Benoit Trio with Guaraldi himself! Aside from Benoit and Christian McBride (bass) and Peter Erskine (drums, percussion), the special guests are Marc Antoine, Russell Malone, Chris Botti, Michael Brecker and Al Jarreau. It's a very pleasant and "tasty" album. And here's a short biography...but if you'd like to learn even more, and listen to some great samples of his music, you absolutely must visit his Web site! And don't forget to check here for up-to-the-minute information on where David is touring! David Benoit's personal relationship with the Peanuts comic strip and its classic Vince Guaraldi-penned jazz trio goes back to 1965, and his childhood viewing of A Charlie Brown Christmas. His professional relationsip with Peanuts began decades later, when Benoit scored several Peanuts specials of his own, after launching his career in the contemporary jazz world with a hit cover of Guaraldi's "Linus and Lucy." He remade the song for GRP Records' Happy Anniversary, Charlie Brown in 1989. A unique duet version, featuring Benoit playing along with Guaraldi's original demo of the song, appears on Here's to You, Charlie Brown -- 50 Great Years! 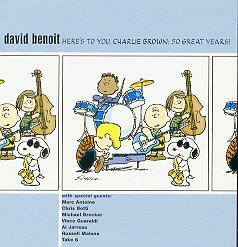 The recording also features new interpretations of other Guaraldi favorites, with two of Benoit's original Peanuts themes ("Linus Tells Charlie" and "Getting Ready," from It's the Best Birthday I Ever Had, Charlie Brown, and a magnificent version of "Happiness," from the musical You're a Good Man, Charlie Brown, sung here by Al Jarreau. Benoit's involvement in the television world of Peanuts is just one of the ways in which the contemporary jazz icon -- voted "Best Keyboardist" at the 2000 Oasis Smooth Jazz Awards -- has expanded beyond the amazing catalog for which he is best known. His first major film score was the Warner Bros. feature The Stars Fell on Henrietta, while his TV composing resume has included music for NBC's Sisters, Shannon's Deal and the new theme for All My Children. Over the last few years, he has scored the film Perfect Game and the television movies The Legend of Cadillac Jack and Final Descent. Benoit recently added the San Jose Symphony to his list of conducting credits, which also includes the London Symphony Orchestra, Nuremburg Symphony, Los Angeles Philharmonic and many others. He also is currently completing his first piano concerto. Nearly 15 years after helping pioneer the sound that defines the "smooth jazz" format, the twice Grammy-nominated composer and pianist has become a world-class jazz ambassador. Although he began recording in the 1970s, Benoit did not become a household name until 1985, with the Spindletop Records release This Side Up, which went to #4 on the Billboard jazz charts. The following year, Benoit recorded with the Rippingtons on their debut album, Moonlighting, which became Jazziz magazine's pick as one of the most influential contemporary jazz albums of all time. Since 1987, he has produced an extraordinary catalog of releases offering many creative and stylistic surprises, which complement his trademark melodic piano playing: Freedom at Midnight (1987), Every Step of the Way (1988, Grammy nominee for Best Jazz Fusion), Waiting for Spring (1989, which spent eight weeks at the top of Billboard's Traditional Jazz charts), Urban Daydreams (1989), Inner Moon (1990), Shadows (1991), Letter to Evan (1992), Shaken, Not Stirred (1994), American Landscape (1997) and Professional Dreamer (1999). Benoit also reunited with Rippingtons leader Russ Freeman on 1994's popular The Benoit-Freeman Project, and contributed on many high-profile GRP collections, including Garfield: Am I Cool, or What? and The GRP All-Star Band. Benoit has plans to take his Peanuts concert even further on the road...so keep checking this site for further details!